I love having paneer in the fridge. It’s a goodun’ to just always have in. Home from work, don’t know what to make? Get on that paneer. 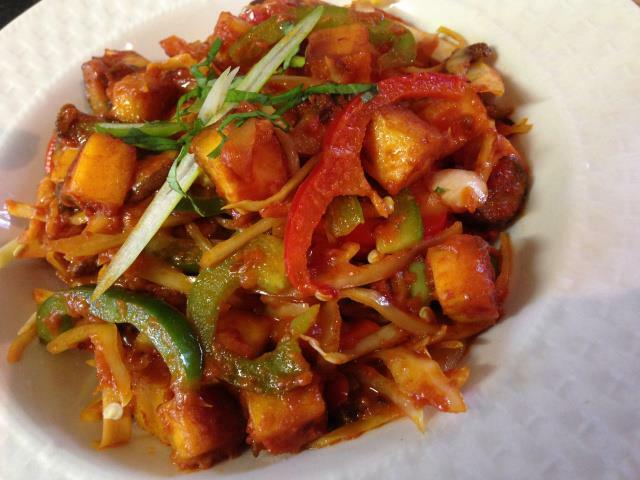 Paneer is an Indian cheese that’s made from cows milk and is rather excellent at absorbing flavours. It has a wonderful almost meaty texture which makes it perfect for cooking it in curries (obvs), as a stuffing (paneer parathas anyone?) or even as a salad topping (toast paneer cubes in a dry pan until golden & crisp & pop on top of your next salad – you’re welcome). In addition, it’s packed full of protein and surprisingly quick to make. But enough of the paneer ad campaign, let’s get onto the good stuff. Today’s recipe is one that transforms this humble cheese into a luxurious, stand out dish. Mopped up with crispy, butter laden naans (I mean if you’re going to do it, do it right), it will not disappoint. This is also a fabulous one to whip out at a dinner party or pot luck. Enjoy. 1) Line a baking tray and pre-heat grill at highest temperature setting. 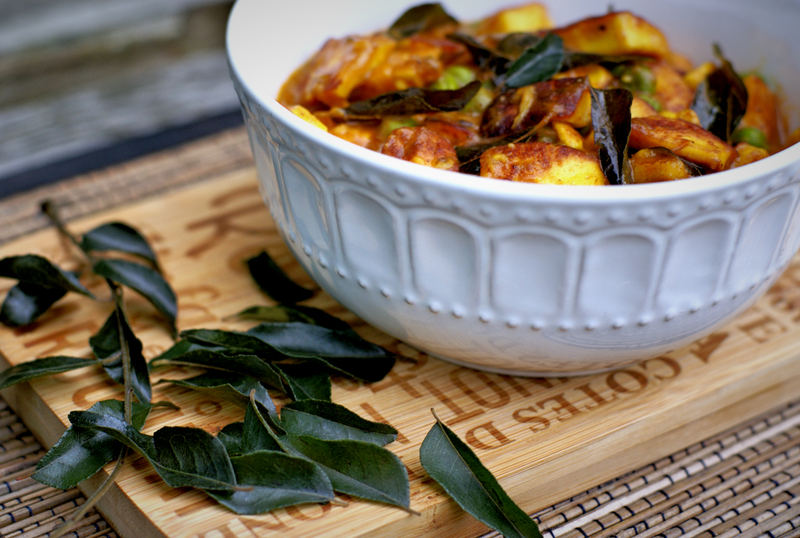 Place all “paneer marination” ingredients together in a bowl and mix well. 2) Tip the marinated paneer into the baking tray and spread all over. Cook in grill for 5 minutes until slightly charred. Remove from heat and turn off grill. 3) Heat oil in a pan. Once hot, add the cinnamon, cardamoms and cloves and cook for 10 seconds. 4) Now add the tomato passata, purée, ketchup and green chillies and cook for 2 minutes. Reduce the heat to low and add the remaining spices and cook for 1 minute. Now add the cream cheese a little at a time, mixing continuously until it is completely blended in. 5) Now add the grilled paneer as well as the fresh coriander. 6) Add one cup of water and bring to boil. Place lid on the pan and simmer for 5-6 minutes. Check the salt and chilli adjust to your taste. Enjoy with naan or chapatis. Yesterday was one of those days. Yes one of *those* days. I woke up early, feeling amazing with a big smile on my face, leapt out of bed with a huge bolt of energy and drew back the curtains to see…oh what have we here? Grey skies, rain, a sodden garden and general wetness and dullness…everywhere. I immediately let out a long grunt type noise, that phonetically spelt out, would be something along the lines of UGGHH. My first thought was to jump straight back into bed and stay there. I mean, Wednesday is nearly Friday which is practically the weekend…right?! I spent a few more minutes trying to rationalise the idea but then opened up my reminders app on auto-pilot, and saw my epic “To Do” list staring at me. Grave error – my dreams of returning to a quilty haven shattered in a single click of the Home button. Some may call me over dramatic (my other half regularly does) but I’m a huge believer that weather can truly affect your mood. I knew that I needed something to “pick me up”. After a quick visit to the gym, (they say you only start burning fat after 20 minutes of cardio – I thought 21 minutes on the step machine was as a solid time) I decided I would make lunch before I started my day. Cooking generally puts me in a good mood and I figured it would give me something to look forward to! This brings me to today’s recipe. 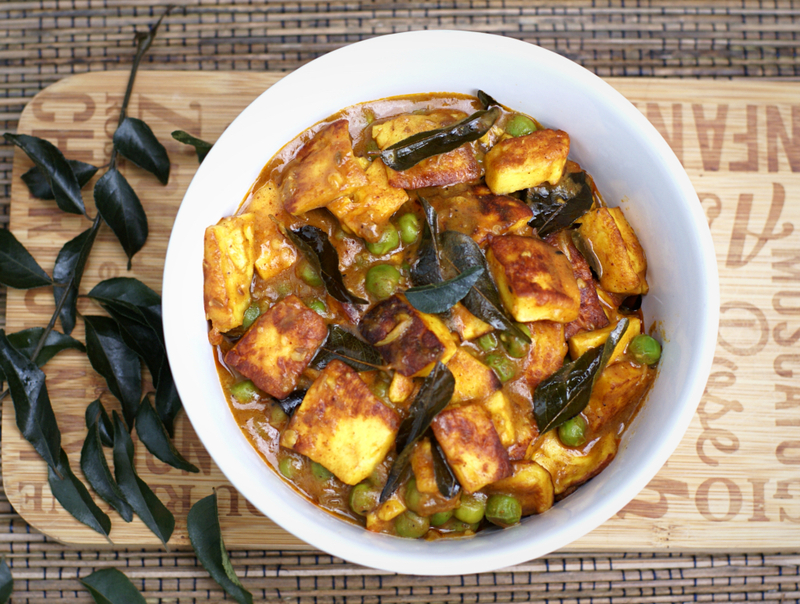 Have you ever made paneer before? I make it ALL the time. It’s so quick to cook, a good source of protein and super versatile. 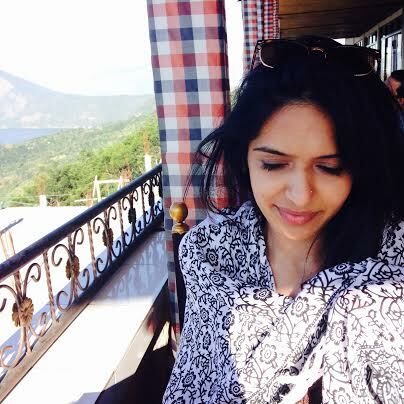 Paneer Mattar is a dish I cook regularly at home – it’s lovely and comforting. Imagine a creamy and chunky casserole but with a depth of warm spiciness and just a cheeky little kick. This time round, I decided to “pimp” my usual recipe by giving it a South Indian twist with mustard seeds & curry leaves. Let’s just say my pre-lunch frown was quickly turned upside-down! If you have never used curry leaves in your cooking before, you must try. They’re beautifully warm and fragrant and bring any dish to life. Heat 1-2tbsp oil in a non-stick pan. Once hot, add the cumin seeds. When they begin to splatter, add the paneer and a pinch of salt. Cook for 2-4 minutes or until golden on one side. Turn over the paneer pieces and cook until golden on the other side. Remove paneer from pan. Add remaining oil to a non stick pan. Once hot, add the mustard seeds and curry leaves. You will see them begin to splatter immediately. At this point, add the ginger, garlic and chilli. Cook for 4-5 minutes or until golden. Now add the salt, paprika, turmeric powder & garam masala. Add the yoghurt and stir quickly. Cook for 2-3 minutes until the yoghurt blends well with the masala. Add the tomatoes and juice and mash well into the masala. Cook for a further 2-3 minutes. Now add the peas and 2 cups of water. Bring to boil. Now add the paneer and cook for further 2 minutes. Check for salt and adjust accordingly. Remove from heat. Serve with hot chapattis or naan bread! You can leave the skin on ginger, before grating - just make sure it's washed and clean. This way you have zero wastage from peeling! You can sauté the paneer in cumin before hand and keep it in an airtight container in the fridge until you want to use it. This paneer can also be used in salads as a tasty topping! Not sure if I’ve mentioned this before (I definitely have) but I love paneer! The beauty of this traditional Indian cheese is its sheer versatility. It’s mild in flavour and as a result absorbs spices particularly well. This recipe is an extremely quick and easy way of making a delicious and satisfying meal in minutes. 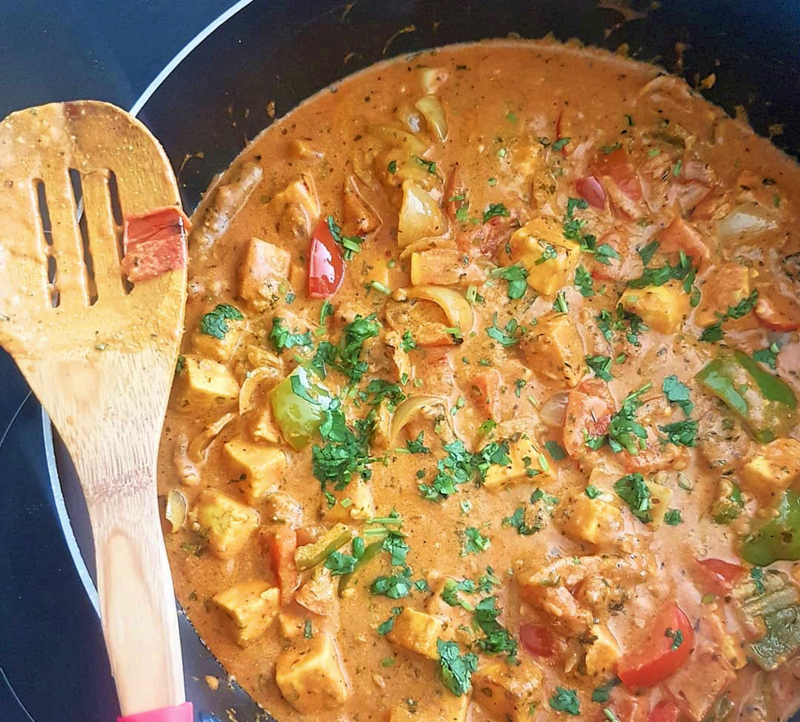 It’s colourful, flavourful and filling and the crunchiness of the vegetables perfectly compliments the creaminess of the paneer…in essence this dish works! Give it a try and do share your thoughts with me. Heat the oil in a non stick pan. Once hot, add the cumin seeds and when they begin to splatter, add the garlic and cook until slightly golden. Now add the paneer and cook for 2-3 minutes , stirring constantly until it turns golden brown. Now add the capsicum, onion, cabbage and cheese. Mix well for 1-2 minutes. Now add the tomato puree, salt, ground ginger powder, chilli powder. Mix and cook for a further 3-5 minutes. Sprinkle on fresh coriander and serve with chapatis or stuff with salad into a wrap.